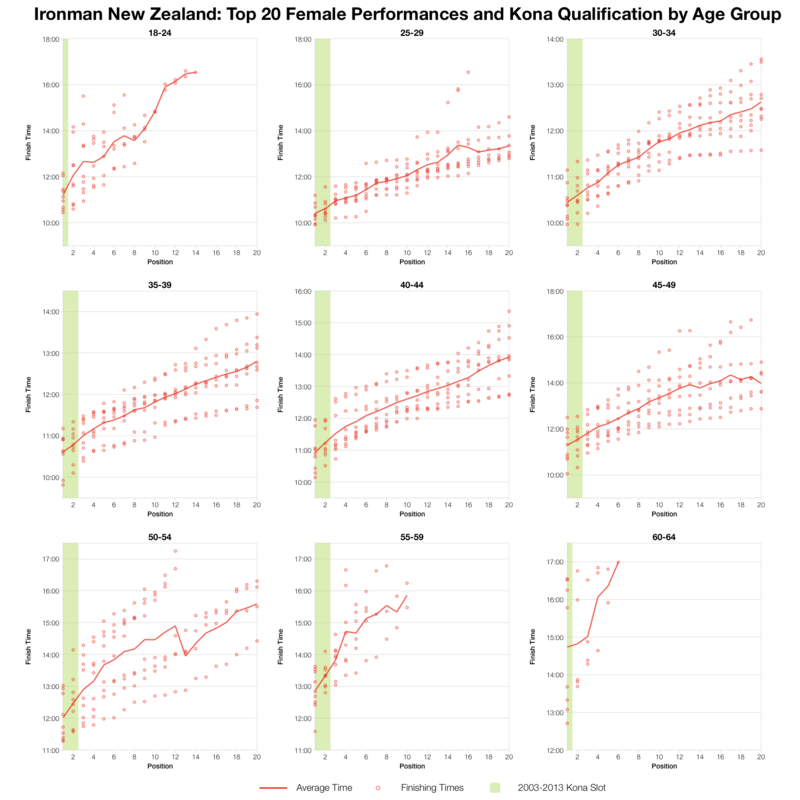 Ironman New Zealand is less than 2 weeks away so it’s time for me to brush up on my results analysis skills with a pre-race look at past performances in New Zealand and the Kona statistics. 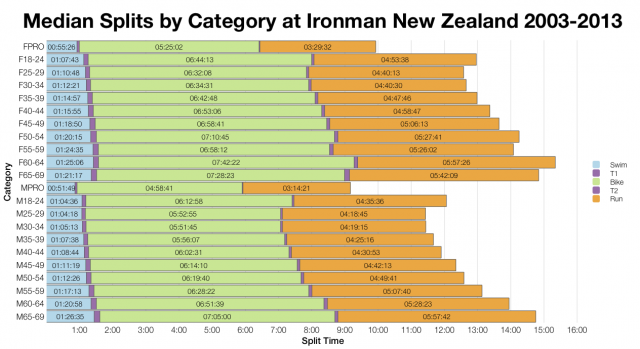 New Zealand is a long standing feature on the Ironman circuit celebrating it’s 30th birthday this year. It’s not the largest race by competitor numbers, but it’s a tough race at the front of the pack. This year top age groupers will be competing for 50 slots to the Ironman World Championships. It’s been a while since I last looked at the numbers in detail, hopefully I’ve not forgot anything along the way. 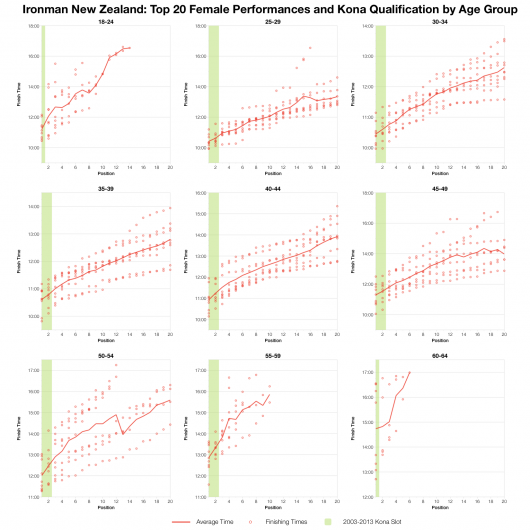 Ironman New Zealand’s results are heavily influenced by conditions in Taupo, in exceptional circumstances these have resulted in major alterations to the race: in 2006 the race became a 70.3 distance bike/run and in 2012 was run as a 70.3 distance event. Both years are excluded from this analysis. The heavy influence conditions have on times at Taupo plays out in the distributions above. A leftward skew to each chart gives some indication of the level of competition while the relatively broad distribution points towards a field that is well spread. There are strong athletes there, but I wouldn’t consider Taupo a fast course. 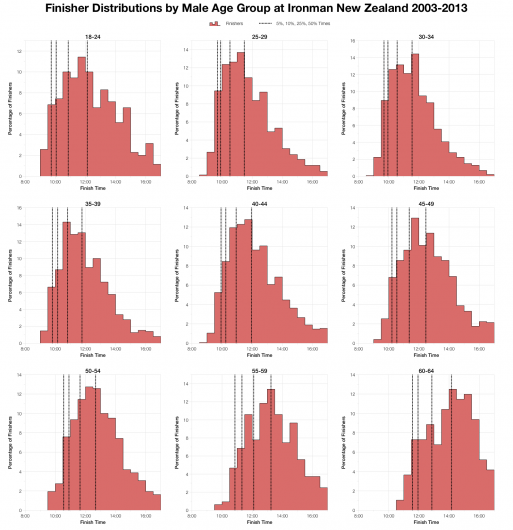 For those who want more detail the above charts break down the finish distributions by age groups. They also show the impact of ageing as the finishing percentiles slowly creep up. The median splits from New Zealand’s races confirm that this is by no means a fast race. 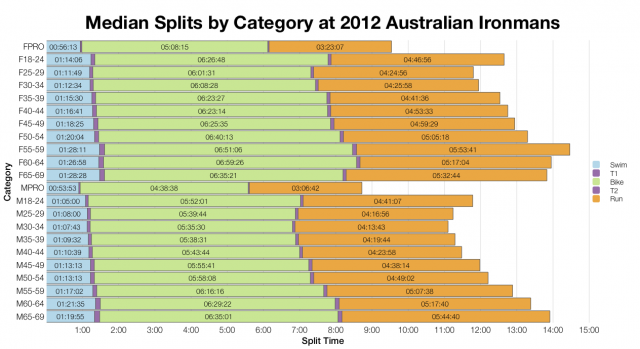 Compared with results from events over in Australia (likely to be the races with the closest overlap of competitors) and we can see that both bike and run have tended to be slower than their 2012 Australian counterparts. 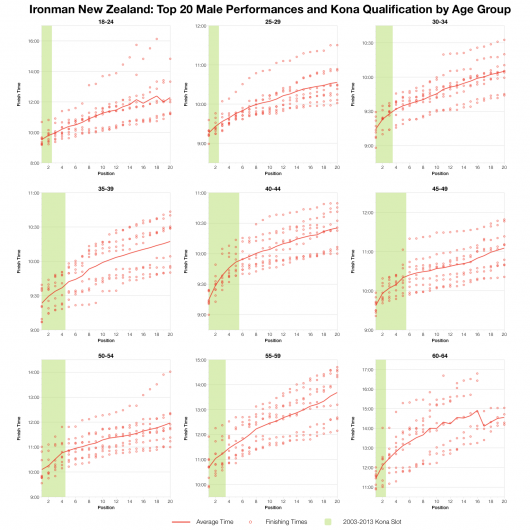 There are 50 Kona slots available in Taupo this year and my estimates of their distribution are given in the table above. Competitor numbers are based on the currently available competitors list at Ironman.com actual start numbers and slot allocation may well vary. 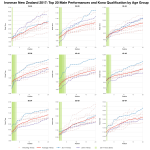 When Ironman New Zealand had it’s own website qualifier details were readily available so it’s the only race where I’ve been able to take an in depth look at qualification and roll down. Based on the estimated allocation of Kona slots the charts above give some indication towards the potential spread of qualifying times. 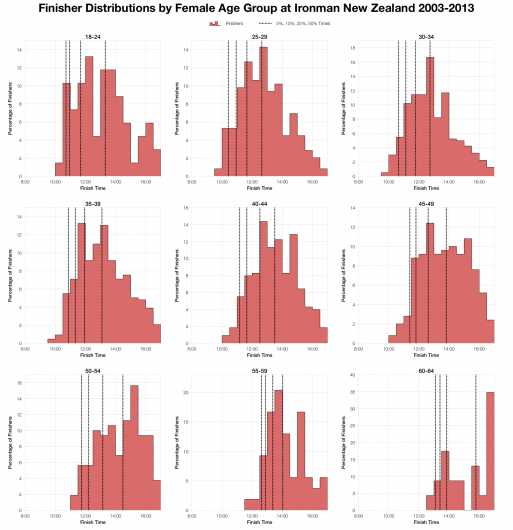 The red lines indicate the average time for a given age group finishing position while the circles indicate individual finishing times in the historical data. 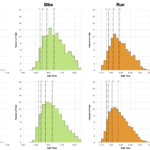 So while we might expect, on average, a 9:50 in the M40-44 year old age group to be enough for the final slot we can also see that there’s quite a variance in results for 5th place and it could be under 9:40 that’s required. It’s impossible to predict the slowest qualification time, that entirely depends on race day conditions and the competition. From an athlete’s perspective these charts may give some hope, but it will come down to successful execution and performance on race day. 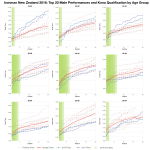 Apologies for any errors – I’m a little rusty at this, but once Ironman New Zealand is out of the way there are plenty more events to practice on with 35 full distance Ironman races in 2014; July through September will be particularly busy. This year Ironman New Zealand falls on the 1st of March, midway through my training camps. There won’t be time for results analysis while I’m away so those interested in how the 2014 race compares will need to wait until after my return on the 10th.